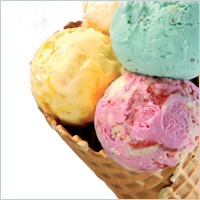 Lesys®™ Crystalline Maltitol is used in a wide variety of dairy products from ice cream to cultured drinking yogurts where its combination of sugar like taste, high sweetness, similar molecular weight to sucrose and solubility provide a range of suitable characteristics for this application. It has a freezing point depression similar to that of sucrose which makes it an ideal ingredient with which to manage final product texture. © Mitsubishi Shoji Foodtech Co.,Ltd 2010. All rights reserved.